OUTFOUND; a unique three-day event series, held along the Columbia River in Hood River, Oregon, will feature performances from Dirty Revival, Stereo RV, and Hustle and Drone. Experience this unique startup competition alongside an eclectic mix of soul meets hip-hop, pop, and beat-based music. June 10, starts @ 6:15 p.m. The event, OUTFOUNDER, is a startup competition for up and coming products and services related to the outdoors and adventure-sports industry. Finally, a tradeshow that offers more than your typical convention center setup. This refreshing twist on outdoor culture serves as a meeting ground for anyone who's ever set foot in the great outdoors. Think of it as an not only an escape from the rat race, but also a movement toward redefining how we look at the outdoor and health business. Dirty Revival is a Portland born band has evolved from the confines of a basement, to some of PDX’s most sought after stages. Their soulful sounds and energetic beat delivers an atmosphere that enraptures any audience. The unique ensemble delivers powerful original tracks and superbly arranged classics with a resounding presence, delivering passionate performances everytime. The band has been actively touring in support of their debut album, the self-titled, Dirty Revival, release. The dynamic, seven-piece soul outfit shines on stage, and defines influences from funk- and soul-infused icons of the past. Described us as Aretha Franklin, Stevie Wonder, Earth Wind and Fire, and Rose Royce all blended up as one. Dirty Revival has shared the stages with musical heavy-hitters such as Michael Franti, George Clinton and the Parliament Funkadelic, Sir Mix-A-Lot, Slick Rick, Nappy Roots and Gift of Gab, and have several multi-regional tours already under their belt. 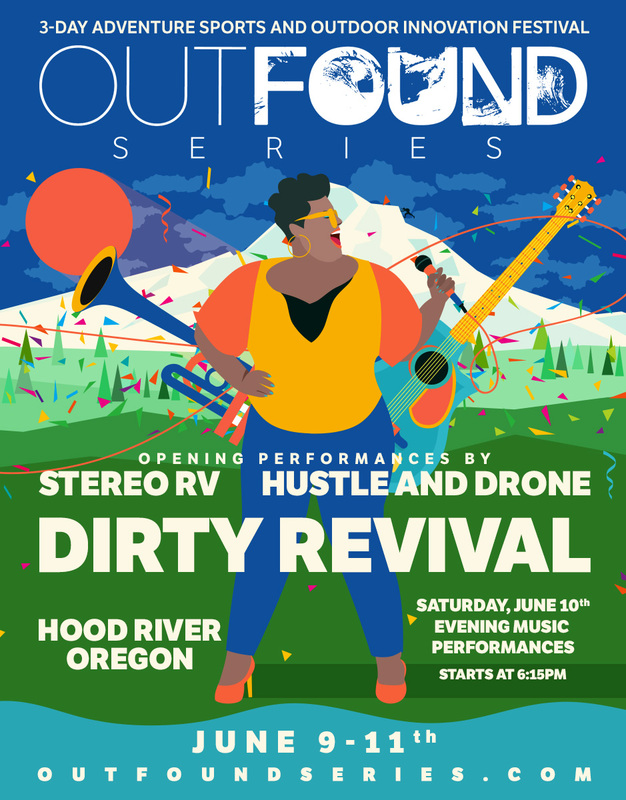 Stereo RV has been thrilling audiences in their hometown of Portland since they began performing together six years ago. Myra Gleason, Stereo RV’s lead singer, has one of the most powerfully expressive voices you’ve ever heard. Her fervent vocals, backed by the guitar and extraordinary beat boxing abilities of her husband, Gabe, make the vulnerable songs on Human, their debut EP, an overwhelming experience. The tracks are flooded with the joys and sorrows of everyday life, given wing by the record’s vibrant production and melodies that will haunt you, even after a single listen. On June 10, in between kiteboarding, yoga, mountain biking and enjoying the outdoors while networking with outdoor innovators and brands at the inaugural OUTFOUND Series festival, outdoor industry focused startups from across the globe will have the chance to participate in OUTFOUNDER and pitch their big idea before a panel of judges from Bend Outdoor Worx. Venture Stage: geared toward companies that are either pre-revenue or very limited revenue (less than $50k annually) and operate withing the outdoor industry. Venture stage companies will have 5 minutes on stage to make their presentation (without audio / visual support) followed by an audience Q&A period of 5 minutes. Audience votes will determine the winner of the venture stage competition. Growth Stage: geared towards companies that have at least $50k in annual revenue and operate within the outdoor industry. Growth Stage companies will have have 7 minutes on stage to make their presentation, followed by 10 minutes of audience Q&A. Bend Outdoor Worx mentors will choose the winner of the Growth State category. Applications were due May 1; competitors to be announced mid-May. The first event of its kind, OUTFOUND Series festival offers three days of bliss for the outdoor enthusiast: activities, food, music, lightning talks, an expo, and OUTFOUNDER, the startup competition. Sponsors include Red Bull, Vibram, and Dogfish Head Beer. Learn more about OUTFOUND Series.